In recent years I've written about techniques that could play a vital role in helping us conserve water in urban horticulture and in agriculture, particularly since the Southwest and the Western States are so dependent upon irrigation to grow crops, parks, sports fields and home landscapes. Water is an issue that's growing and will not ever go away in our life time, so we better be on the learning curve of how to deal with it. Soil Secrets has gotten better and better at what it does as a Soil Ecology company, with our Material Science and product line-up performing at a cutting edge pace. For example, what we were doing 20 years ago was pretty fantastic and got the attention of many new clients and industry leaders, however compared to what we can do today, it was pretty crude stuff. And compared to what the typical retail nursery garden store sector is offering today, our materials are like comparing the Tesla Premium Electric car to the first Model T, particularly when it comes to rehabilitating the soils health and conserving water. 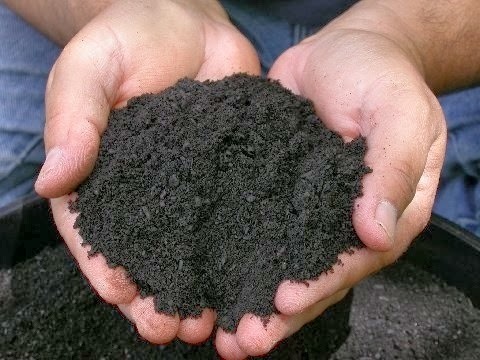 Historically our industry has tried to fix soil by adding gobs of organic matter in the form of compost, peat moss, worm castings, mushroom compost or aged steer manure, in the hope that we could create a top soil out of poor dirt. The results were sketchy at best and the soil structure may actually be damaged because of the high salt index of some of these materials, i.e. the steer manure and the mushroom compost. 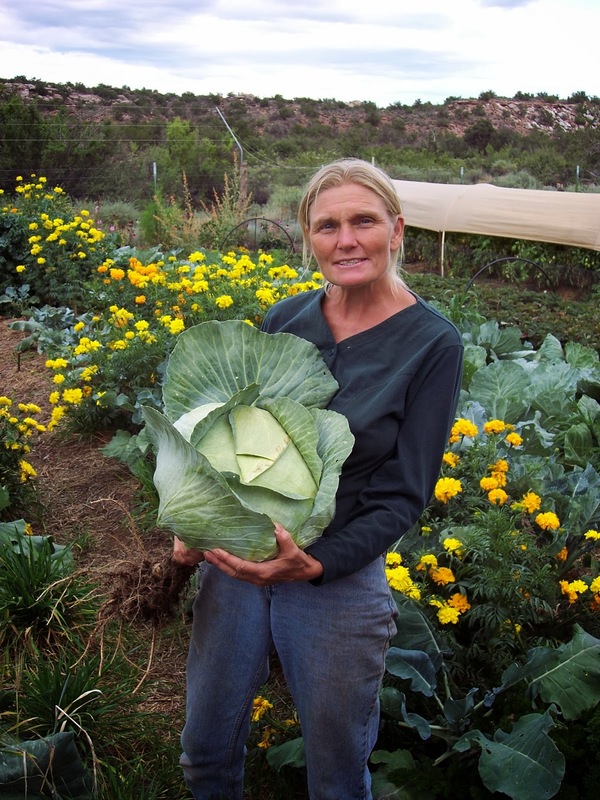 In New Mexico, even compost can cause soil structure problems as there are few good sources of compost being sold that are not rich in excessive salts with the added problem of high pH chemistry. The problem is the source/ingredients used to make the compost are not dependable or consistent and often times salt rich manures are used. There is composting methodology described by David Johnson, PhD in molecular biology from New Mexico State University, Institute for the Energy and the Environment, where compost made with dairy manure can be remediated to not be problematic with salt, however his technique is novel and not being used by the commercial composters thus far. So all the nurseries push adding compost and other soil amendment products in the attempt to fix soil, regardless of the efficacy of the practice. I even heard a PhD Extension Agent from Colorado say you cannot add too much compost while building the soil of your new home. However he's very wrong on that point. On the surface the technique sounds good and logical since we know that our poor desert soil did not look or behave like a rich top soil. It was not capable of storing water, providing slow release moisture to the vegetation. It was not capable of keeping the trace elements constantly available for plant use and it just didn't look like a rich dark top soil. 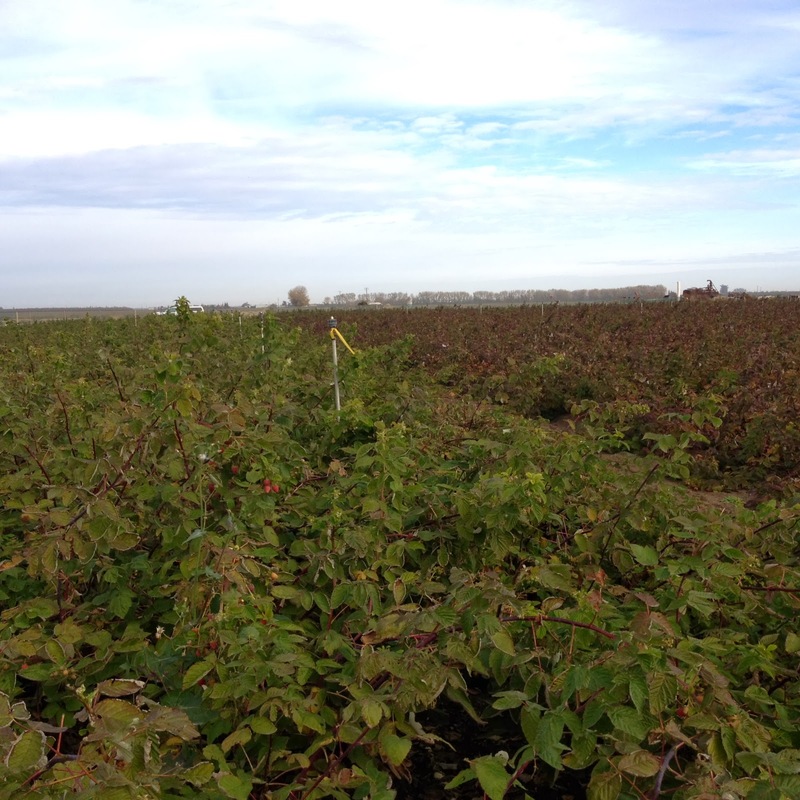 Without water being constantly available the mineral trace element nutrients cannot be held in a 'nutrient water solution' for most of the growing season, something necessary for proper plant nutrient uptake. The problem of watering (irrigation) followed by a drying out period resulted in this sequence of events. We water and for a period of time the soil could be too wet making it anaerobic (without oxygen), which causes the toxic build up of root poisons like lactic acid and alcohol. 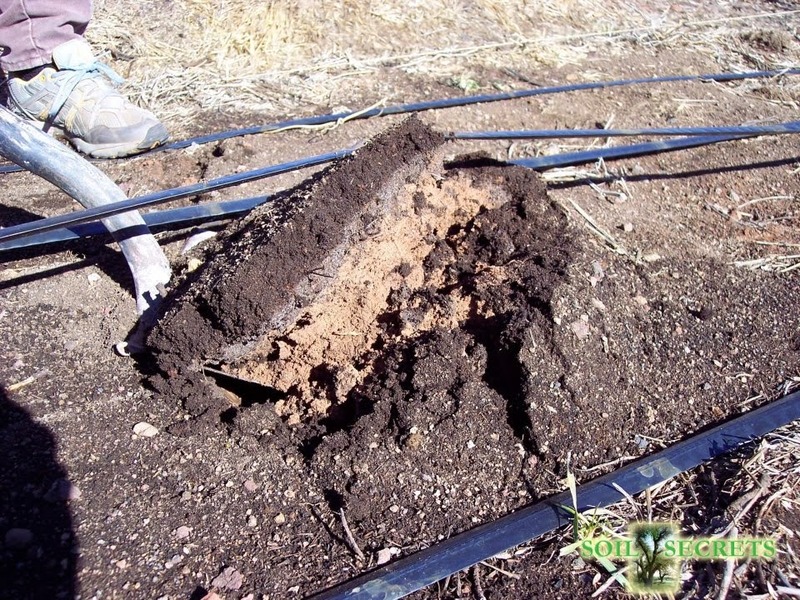 The soil then begins to dry out and for a brief period of time there's just enough moisture to maintain the 'nutrient water solution' until the soil gets too dry. During the excessive dry phase, vegetation has trouble conducting photosynthesis because water and mineral nutrient uptake are needed for that process to work. Without photosynthesis glucose production stops and the transference of the liquid carbon (glucose) to the rhizosphere (figure 1) biomass of microbes is inhibited. Not good for those beneficial microbes! 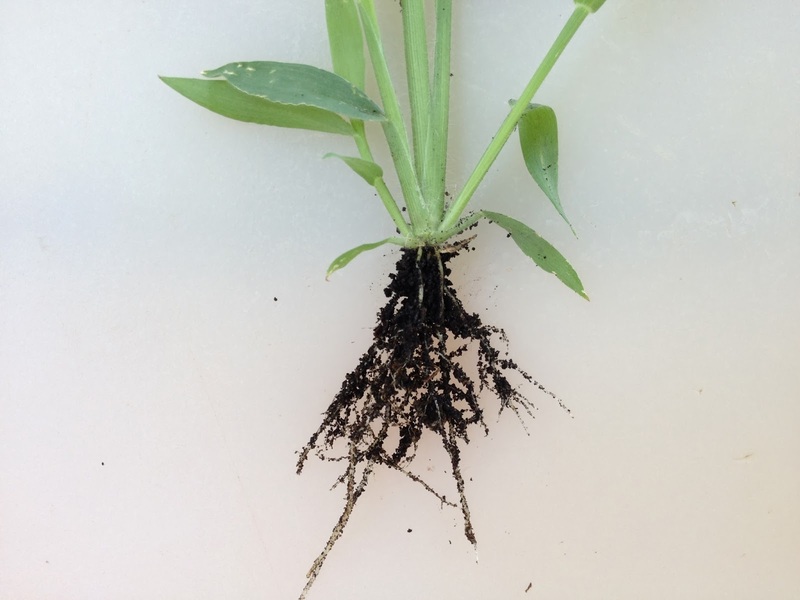 The rhizosphere is the narrow region of soil that is directly influenced by root secretions also called root exudates which is the mono saccharide glucose needed by the soil's microbiology including the mycorrhizae. It's this terrestrial biosphere of microbiology that builds the amazing molecules of supramolecular humic acids, the black stuff that makes a top soil dark in color. The result of the soil being too wet, just wet enough and then followed by too dry is a feast-or-famine cycle, which is never good for plants. Then we have the obstacle of the soil chemistry pH being too high for many of us living west of the "lime line" center of North America's continent. When the soil pH is high (alkaline) many of the trace elements such as iron and zinc, etc., are chemically occluded and not available for uptake. In the case of alkaline soil with poor mutualistic microbiology "solutioning" of the indigenous trace elements is not taking place, therefore they are not easily available! The commercial entities such as retail nursery's and agriculture farm fertilizer company's traditionally suggested using acidifier products to try to force solutioning of the trace elements, but the process is not a permanent fix and may actually cause a multitude of other problems that are worse than the original problem. Adding lots of organic matter was also popular, hoping that would fix the problem, however in recent years Professional Soil Ecologists have come out of the wood work educating people that adding organic matter to soil is a bad idea as it increases the Biological Oxygen Demand of the soil causing it to go anaerobic, not a good thing. Plus it doesn't do anything for instigating and perpetuating the bio-geo-chemical process of a healthy soil. However there is a solution and its one farmers and urban horticulturists across America are starting to learn about. The link below takes you to a web site that gives old outdated information about how to solve the problem of Iron Chlorosis. The nurseries and garden centers of the world need to get on the learning curve about this, as do the agronomists that advise farmers. Click here: AOL Image Search result for "http://landscapelawninorder.com/blog/wp-content/uploads/2013/05/iron-chlorosis-maple. Click on the link below to view the brochure on the event. The following are bullet points that will be used in Michael's lecture. These points are also in his paper, in the conference proceedings. 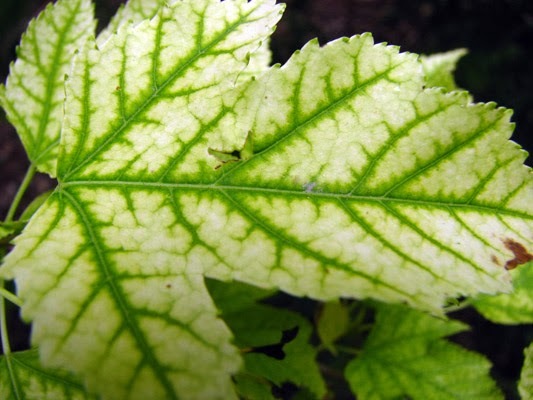 Some of this science explains why gardeners in the western half of the United States often have problems with yellowing of leaves called Iron Chlorosis. The image below shows a Maple Leaf with Iron Chlorosis. Most of the time nursery people, blogs and forums will provide solutions to this problem by recommending one of two techniques. Acidify the soil, or treat the soil and the plant with extra chelated iron. However is this the real solution, or is "solutioning" via the Carbon Connection the answer? 1. The Carbon Cycle: what is it, how does it work, what are the various forms of carbon in soil and what are the characteristics of the various forms? Is all soil carbon just dead and rotting organic matter? Does dumping tons of manure or compost onto the site fix the problem of poor soil, poor plant nutrient uptake, etc. 2. The Bigger Problem caused by poor soil: We now have the lowest nutrient density in our food that we've ever had at any time in human history and we can relate this to what's happening to us health wise. I don't know what percent of our health care in the United States is disease care, but we are told by our government that our National Health Care represents 30% of our entire economy, the GDP. Health Care in the United States is not keeping people healthy, its only Disease Care which is causing the health care system in the United States to crash. Disease is directly related to our poor diets, caused by food weak "Nutrient Density" a deficiency of trace minerals which compromises our immune systems ability to work properly. Most disease of humans is nutritionally related. We don't have the trace elements in our bodies because our food lacks them and our food lacks them because our soils are compromised at most conventional farms and even Organic Certified farms. Farm soils are compromised because the farmers are not on the "Journey to Better Soil Health" and are not working on building the carbon levels in soil. As a whole our farmers and our academic society of farm experts do not understand the distinction of the various forms of carbon in a soil. Not all soil organic matter in the soil is the same! 3. Our soils are not functioning well anymore and carbon is all about the functionality of the soil contributing to the bigger picture of helping plants uptake the trace elements. You are what you eat. 4. Solutioning Soil Elements: If the Carbon Cycle is weak or disrupted than the flow of trace elements to the plant is compromised, as its the combination of powerful Humic molecules and the soil microorganisms that make the trace elements available by "solutioning" the process of dissolving the trace elements from the complex chemistry of the soil into available mineral nutrition. Microbes bring trace elements to the plant via "Solutioning" in exchange for food provided by the plant in the form of carbon rich monosaccharides sugar. The sugar was made in the plant leaves from atmospheric CO2 fixed during photosynthesis. The plant then exchanges the energy carbon rich sugar for minerals that were made available by mutualistic fungi called mycorrhizae and by the terrestrial biosphere of soil microbes. 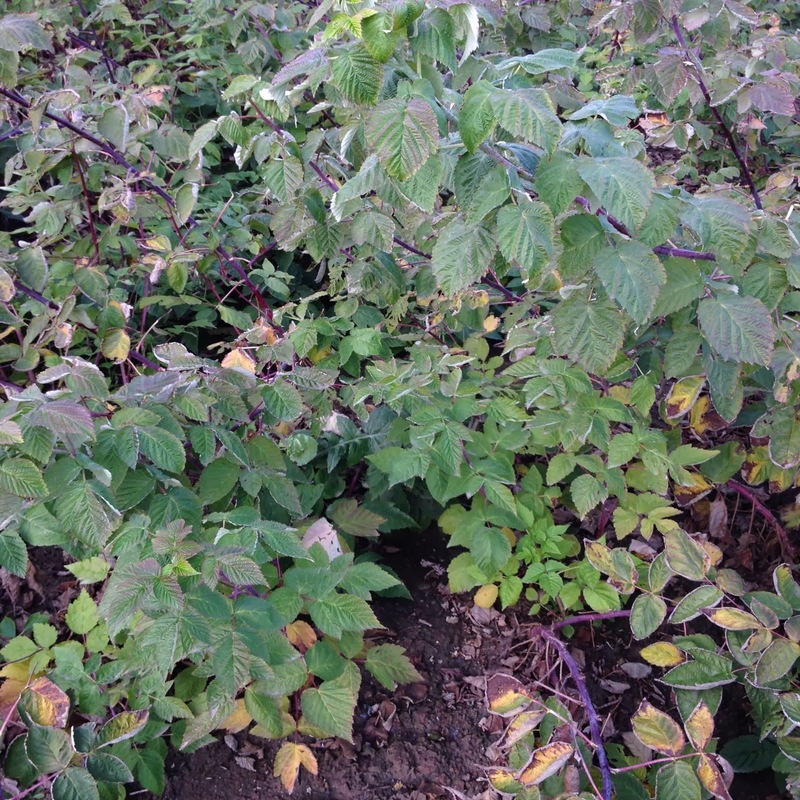 So if you have a mineral deficiency in the plant such as Iron chlorosis and the soil is known to have adequate iron levels, almost always the case in Western soils, than you have a soil microbe problem! 5. If the plant is unable to uptake what it needs from the soil it will do a lessor job of producing liquid carbon in the chemical form of monosaccharides such as fructose and glucose, energy needed by the soil microorganisms. The carbon element found in the monosaccharides came from the atmosphere's CO2 during photosynthesis and the carbon elements found in the molecular structures of the Humic molecules also came from the atmosphere's CO2. A process called Carbon Sequestering which results in the accumulation of long term banking of recalcitrant carbon in the soil! This is what we call top soil! The Humic molecules are recalcitrant supramolecular substances rich in carbon! Compost, manure, peat moss, worm castings and combustible soil organic matter (measured in soil tests) are also rich in carbon, but the carbon is not recalcitrant, its labile, which means it will rapidly break down and turn back into CO2. Recalcitrant carbon substances of soil have a long resonance time in undisturbed soil, possibly lasting thousands of years! 6. However without soil microbes helping with adequate trace element uptake resulting in optimum photosynthesis, producing extra monosaccharides leaking from plant roots as exudates food for microbes, we would never see carbon sequestering into recalcitrant carbon substances resulting in the accumulation of top soil. Without soil microbes Humic molecular carbon would fail to form and accumulate because the precursor chemicals would be lacking. The whole thing is called the Carbon Connection and its a must if we are ever going to fix our soils and live on the right side of history. WHITE LIGHTNING – Mycorrhizal Inoculant - Charge Your Roots To Power Your Plants! The Right Stuff for Growing WORLD RECORD Pumpkins! Humus that contains supramolecular humic molecules (generically called Humic Acids) and plants that are mycorrhizal are the key to successful agriculture. So implementing the use of humics that are guaranteed to be supramolecular and inoculating the crop with the mycorrhizal species Glomus intraradices will play a significant role in producing the maximum yield of any short season crop including the production of World Record Pumpkins. Trace Minerals: Kelp is for trace minerals and since we use kelp in everything we produce at Soil Secrets, using our protocol always results in plenty of trace minerals. Don't use more if you are using TerraPro, Earth Nectar, Earth Ambrosia or Protein Crumblies at minimum label rates. Since Kelp and Raw Whole Organic Milk are major ingredients in formulating our TerraPro's humic characteristics and kelp is also used in the formulation of the other listed products, our protocol provides a healthy dose of trace minerals. For example, in acid soils Calcium is a limiting factor and all plant and animal life need Calcium. Well there's no better source or better molecular configuration for Calcium than what's found in Raw Whole Organic Milk, and the molecular configuration of the humic molecules of TerraPro are made by using milk. What makes a plant produce biomass is the combination of energy from the sun, nitrogen from the protein coming from the soil microbiology (what we call the Soil Food Web), carbon from the atmosphere and the major base cations occupying the Cation Exchange Capacity of the soil. Hopefully your soil is dominated by the base cation Calcium, which is often the case in a high pH soil (alkaline). Cation Exchange Capacity is abbreviated CEC and if its low, often the case with sandy soil, then fortifying the site with humic molecules that have an extremely high CEC will help you hold onto those base cations you have purchased and applied to the site. Adding our supramolecular humic molecules of TerraPro will fortify additional CEC potential, helping to retain the base cation minerals that are being added to the site, for example, in the form of slow release fertilizers like Compost. While the CEC of TerraPro's humic molecules is huge, adding the product will not change the indigenous CEC of the soil, unless you added a ridiculous amount of it. The exception of needed to add huge amounts of TerraPro is when you’re dealing with toxic and corrosive mine tailings. The major base cations of soil such as the calcium may not be abundant in a soil with a low pH, or the minerals might be cemented into the chemistry of the soil and the plant is unable to make them available via a "solutioning" process. Solutioning is a term of geology where carbonic acid and other weak acids of soil chemistry dissolve the solid mass of rock, putting the elements of the rock into a liquid solution. Once in a liquid solution plants are able to uptake those minerals as needed. Both the mycorrhizal relationship and the supramolecular humic molecules that make up the persistent carbon of soil play a huge role in plant nutrient uptake potential by solutioning the indigenous minerals of the soil that the plant cannot get on its own. The humic factor helps to keep the minerals in a water nutrient solution longer, as the molecules of the humics, if supramolecular only, hold water molecules from evaporating away so easily. If the soil has a poor Soil Food Web which is almost always the case, then it's prudent to fortify the Soil Food Web with Protein Crumblies to make sure there's enough protein nitrogen cycling on the site to satisfy every part of the terrestrial biosphere including the pumpkin crop. 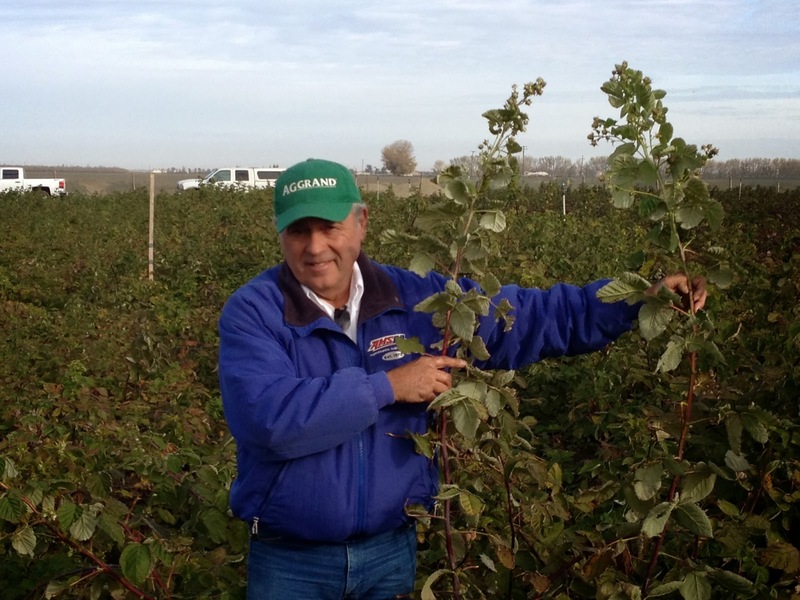 New Mexican's invited to the 1st International Humus Experts Meeting! Most agree that the most essential part of a healthy and productive soil is the amazing carbon rich substance commonly called "Humus", the black stuff that makes a top soil different from dirt. Regardless of what you are attempting to grow, wither it be trees, turf, a park, a sports field, or a crop, you cannot excel without the soil first being healthy. That characteristic is contingent upon the soil containing enough molecular carbon with the proper characteristics. This has been mysterious at the least for most of us, however for the first time a gathering of the worlds leading experts on this topic will meet to cuss and discuss the science of Humus. The 1st International Humus Experts Meeting will be held in Kaindorf, Austria in a few days, January 22nd and 23rd. There are eight experts that have been selected from around the globe, to present at this event, each noted for areas of expertise on topics relevant to building better top soil. New Mexico is blessed to have two of the eight experts at this meeting Native to the Land of Enchantment. 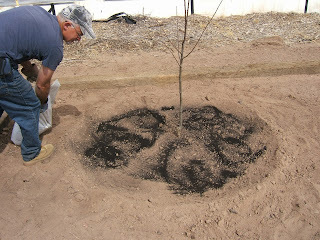 David Johnson, a molecular biologist Senior Project Specialists with the Institute for the Energy and Environment - New Mexico State University & Michael Martin Meléndrez, owner of Trees That Please nursery in Los Lunas and a soil bio tech company Soil Secrets Worldwide LLC. Soil Secrets produces materials that are used in the reclamation of mines, development of soils for landscaping and the inoculation of crops. They are the industry leaders in Mycorrhizal inoculants and the powerful carbon biologic molecules generically called Humic Acids. We understand that most of us are busy and cannot travel to Austria at the drop of a hat, however we feel its important that you are aware of the happenings in the field of soil science including this event. Sandy soil has large particle size, as compared to clay soil, with large air spaces between them. Therefore, it tends to drain and dry out quickly. 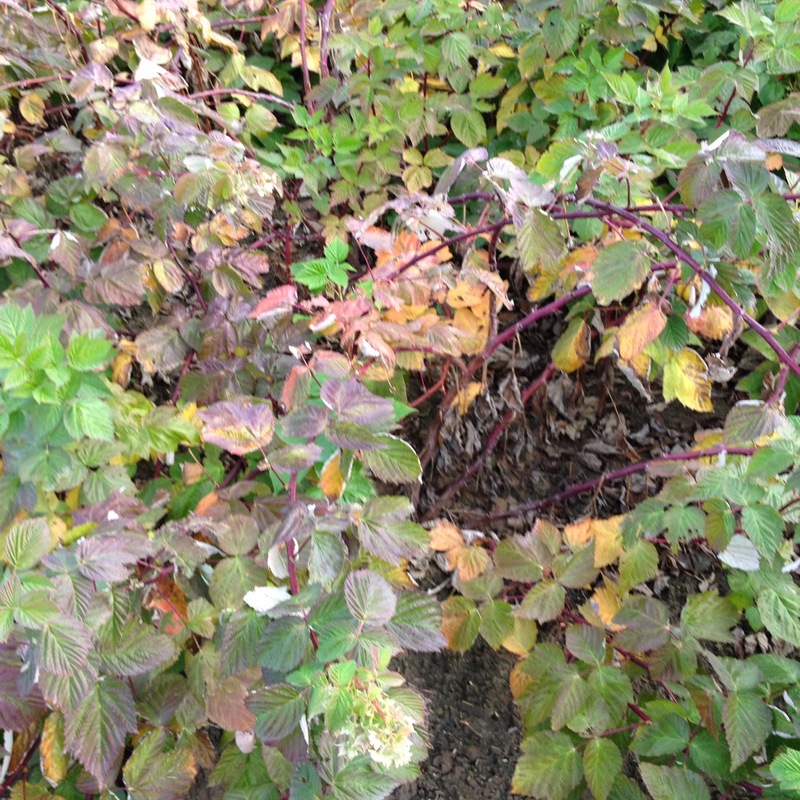 In addition, water-soluble nutrients leach out rapidly before the plants can use them, carried away with water. When amending sandy soils, one goal is to increase the sand’s ability to hold moisture and retain nutrients. Humus incorporated into sandy soil acts like a sponge, holding water and the nutrients dissolved in it. This retained water and nutrients are available for plant growth. Humus consists of decay resistant recalcitrant carbon compounds that help to give soil its life and structure. Humus added to your soil can last for centuries unlike compost and fertilizers which are rapidly used up by soil microorganisms and plants. Compost and fertilizers only have a short duration in the soil perhaps weeks or months. On the other hand, added humus can have long lasting benefits, for example, increased water and nutrient retention when applied to sandy soils. Increase the humus content of sandy soil at every opportunity. For gardens and landscapes, add humus yearly, several months ahead of the planting season or during the season for established plants and lawns. After planting a tree or shrub apply Humus in the form of Commercial Grade TerraPro® (Earth Magic®) to the soil surface, cover with mulch, and water thoroughly. This will allow the soil to stabilize and be colonized by beneficial microorganisms like Ecto and Endo Mycorrhizae needed by 95% of all plant life. 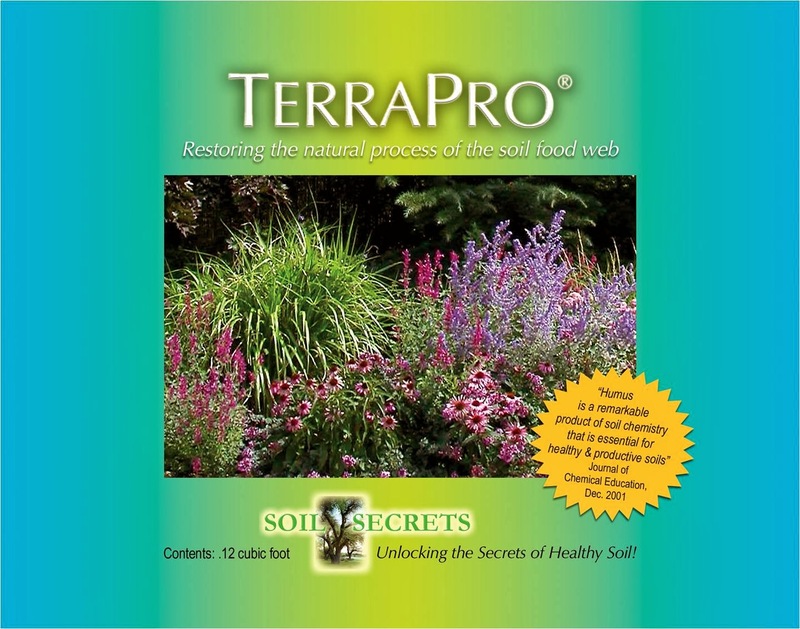 Soil Secrets formulates Commercial Grade TerraPro® (Earth Magic®) and Agriculture Grade TerraPro® Humus Soil Conditioners for the Home Owner and Farmer, as well as for the Engineering and Construction industries that deal with mine reclamation, erosion control, and vegetation management. The objectives of these products are to fortify the soil with humic acids.